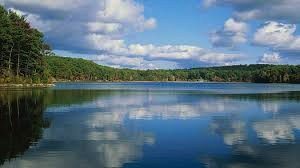 I’m preparing for a open-water swim across Provincetown Harbor (charity event) in September, so I train at Walden Pond in the early mornings. It is a gorgeous place. There are a fair number of us swimming across and back, as well as trout fishers on the shore and the occasional boater. This morning I was making my way across for my first lap when a man fell off his paddle-board. I switched to the sidestroke and asked if everything was okay. “Yes,” he said cheerfully, clambering back aboard. “Happens all the time.” I wished him well and returned to the forward crawl, and then it occurred to me that I had just had a mundane social interaction, in 40 feet of water. I love my weird life. I love your weird life, too. Thanks for telling us about it.